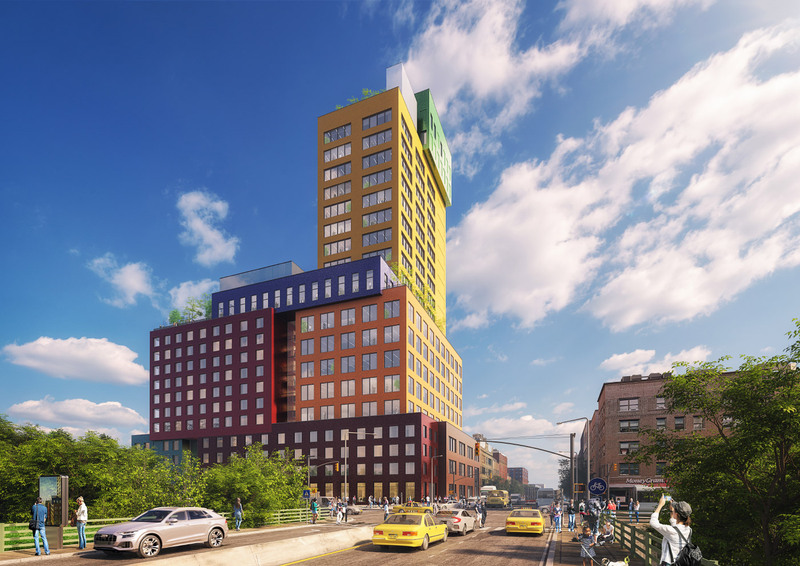 A flash of rainbow is set to touch down in Manhattan’s Washington Heights, as MVRDV’s first project in the United States broke ground earlier today and released a swath of new renderings. The technicolor 22-story Radio Tower & Hotel will be sure to stand out for better or for worse once it’s finished, as it’s springing up in a neighborhood mainly known for blocks of low-slung, turn-of-the-century brick Renaissance Revival–style buildings. Rotterdam-based MVRDV is no stranger to stacked, staggered, and carved forms and bright splashes of color, and from the renderings, it appears that Radio Tower will keep true to that tradition. 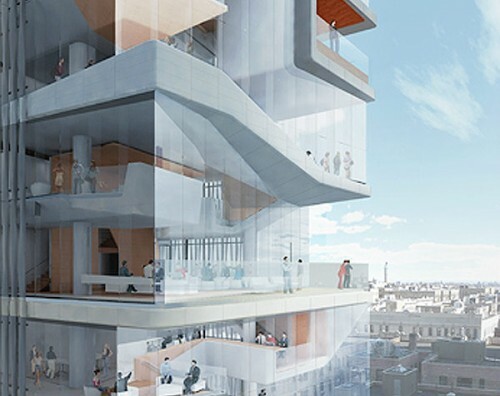 The mixed-use tower, described by MVRDV as a “vertical village,” was designed to “pull” office, residential, and hotel space off of the ground level and onto a single building. Each of the staggered volumes, about the size of a typical building in the neighborhood, has been assigned a different color and corresponding unique use. For instance, the horizontal blue box at the tower’s center will be reserved for event space. 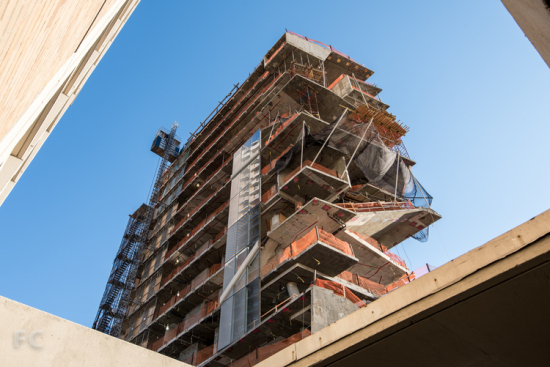 The 234,000-square-foot building is set to rise at the base of the Washington Bridge on 181st Street and Amsterdam Avenue, right where the street grid drops off into Harlem River Park. Because the site is at the edge of the Harlem River and none of the adjacent buildings come close to reaching the same height, Radio Tower should contribute significantly to Washington Heights’ skyline. MVRDV has used colored ceramic brick for the building’s facade, and the firm states that the color of each box is a reference to a typical fixture in the predominantly-Hispanic neighborhood—a design diagram cites brick, murals, supermarket and bodega canopies, and local restaurants as informing their palette. The staggered massing will also preserve views for residents and guests, as well as carve out rooftop terraces atop each of the volumes. A coffee shop and community garden in the building’s communal internal courtyard will be open to the public, as MVRDV has wanted to create both a “welcoming beacon for people entering Manhattan” as well as a community amenity. Still, it remains to be seen how the Washington Heights community will react to the announcement. A proposed rezoning of Inwood a bit further north drew furious protests from uptown residents, as has the Columbia University Medical Center’s previous expansion plans. No information on the affordability of the complex's residential portion has been revealed as of yet. When the attention of real estate speculators diverts, sometimes old neighborhoods have time to acquire a majestic patina. The Washington Heights section of northern Manhattan has been neglected for some time, but is now getting a fair share of spillover interest from Columbia's Manhattanville project and the university's nearby hospital campus. In 2009, the Audubon Park Historic District was created to protect the area just behind Audubon Terrace, home to the Hispanic Society and the Academy of Arts and Letters. But just north of the district, years of landlord neglect has unwittingly preserved row after row of early 20th century apartment buildings festooned with ornate cornices. But the cornices are now in danger of disappearing. Provided you look up, there are still vistas in Washington Heights that recall the area’s heyday. In the early part of the last century a striving middle class made up of German Jews, Irish, and Greeks walked beneath striped fabric awnings perched at apartment windows, all topped with fanciful cornices. Most know that when Robert Moses plowed through the Bronx to build the Cross Bronx Expressway, neighborhoods were severed and died a slow death. 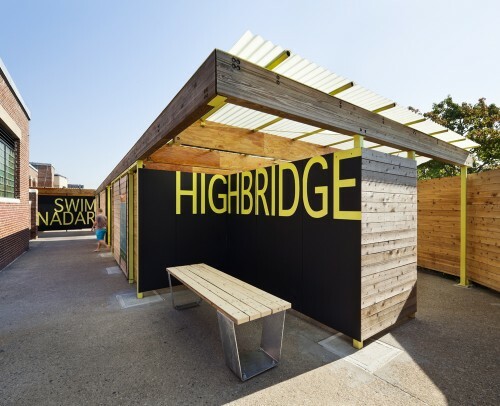 But little attention is paid to the Cross Bronx’s connection to the George Washington Bridge, which severed Washington Heights too, providing easy access for suburbanites to swoop in and out of the neighborhood to buy drugs. Eventually, like the South Bronx, the area regained its footing. Now, the Pier Luigi Nervi-designed Port Authority Bus Terminal at the base of the bridge is set to undergo a $285 million restoration. And Starbucks, the ever present harbinger of gentrification, is just a few blocks north. But just as Washington Heights begins its reemergence, several building owners are stripping away the architectural features that make the area unique. Just next door to the bus terminal sits 4195 Broadway at the corner of 178th Street. Two weeks ago, the decorative lion heads that once reigned atop the 1920 edifice were stripped, thrown into a dumpster and replaced with corrugated metal. It’s indicative of a neighborhood trend. Over the past several years the cornices of Washington Heights are finally getting much needed maintenance attention. But instead of restoring them, many building owners are ripping them off and replacing them with steel, aluminum, and concrete. Photographer Trish Mayo noticed the latest affront on a bus ride home from the library. The shapes in a dumpster registered as something familiar to her. She got off the bus to investigate. 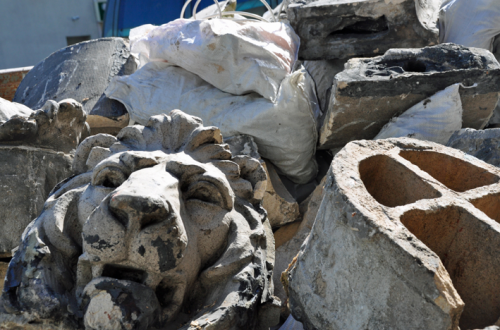 Mayo said the dumpster was almost full with terracotta lion heads taken from 4195. The dumpster has since been carted away. “I think that after so many years of neglect the decorative details have become a safety hazarded and it’s just cheaper to destroy all the beauty that’s in these buildings,” she said. Manhattanville's Piano. 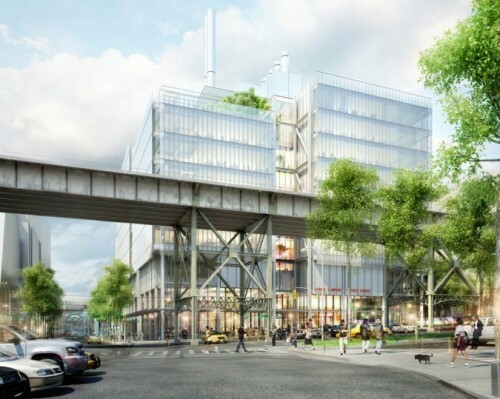 While tallying who is the biggest landlord in New York (it's still the church by a hair), The Observer uncovered a few new views of Renzo Piano's Jerome L. Green Science Center at Columbia's Manhattanville campus, seen here next to a train viaduct. Pedestrianizing New York. 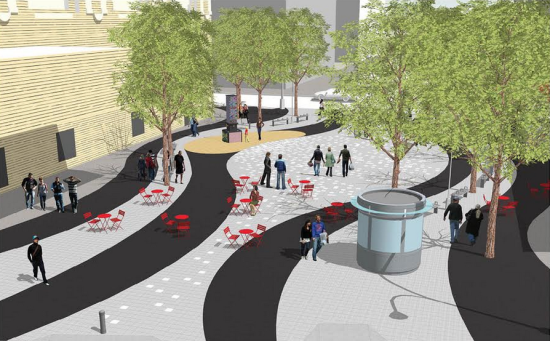 The remaking of New York's public spaces continues its forward march. Brownstoner has details on the planned pedestrian plaza on Myrtle Avenue in Brooklyn and StreetsBlog highlights DOT's plans to create a permanent block-long Plaza de las Americas in Washington Heights. Archi-babble. Witold Rybczynski talkes issue with architecture's professional jargon in Slate, including a beginner's guide to commonly used words from assemblage to gesamtkunstwerk. What's your favorite word from the language of architecture? Subway Squeeze. We're not talking about your crowded commute, but New York Governor Andrew Cuomo's proposal to trim $100 million from transit. 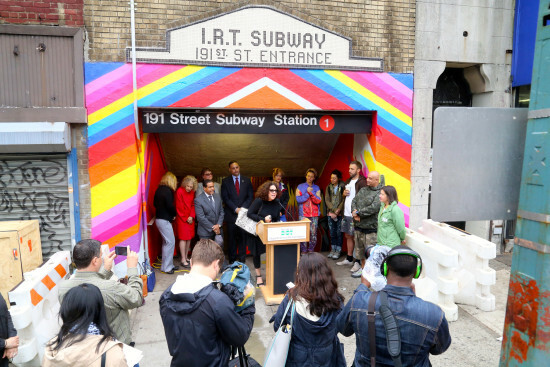 Transportation Nation and StreetsBlog have the details and implications for getting around New York.